Conservation requires that species are monitored to ensure the persistence of species and ecosystem processes. In areas with large numbers of threatened species, this can be a major challenge. Here we explore prioritising species of special concern on the Cape Peninsula, South Africa, conserved primarily in the Table Mountain National Park. With 307 terrestrial plant and animal species listed as threatened on the IUCN Red List (plus 208 as non-least concern) and 332 endemic to the Peninsula, it is impossible to monitor and manage all species with current resources. At a workshop of conservation managers and ecosystem and taxonomical specialists, 14 variables were incorporated into a simple scoring scheme to develop a priority listing of these species. Despite care to ensure that variables were independent, there was strong autocorrelation amongst biotic versus management variables. There was concern that biotic variables would be masked by management criteria, but this was not the case. We propose that monitoring should focus on as many top-scoring species as resources allow (including volunteers) and that setting a cut-off value for delimiting sensitive species should be eschewed. A major challenge is that many species are typical of lowland ecosystems, which are poorly represented in the national park. Although priority species for monitoring have been identified, this will need to be tempered with the monitoring costs and logistics of implementing the programme. CONSERVATION IMPLICATIONS: Owing to the large number of threatened and endemic species in the Cape Peninsula, it is impossible to monitor all species with current resources. Management must focus on ecosystem maintenance as species-focused management will inevitably result in conflict with other threatened species. Monitoring should focus on as many top-scoring species as resources allow. The costs and logistics of a monitoring programme still need to be worked out.  deciding which of these species are to be monitored and which species require conservation action. Here we report on the outcome of such a process (specifically the first two points) for the initial prioritisation of species in the Table Mountain National Park (TMNP) in the biodiversity-rich Fynbos Biome. The decision about the species selected for monitoring is constrained by the financial and human resources available and will be the subject of a forthcoming analysis (Rebelo, Freitag-Ronaldson, Cheney & McGeoch, unpublished results). South African National Parks (SANParks) is mandated to conserve plant and animal species within parks as well as the ecosystems they represent. To this end the organisation must monitor and, where necessary, take conservation action to ensure that species in national parks do not become extinct. 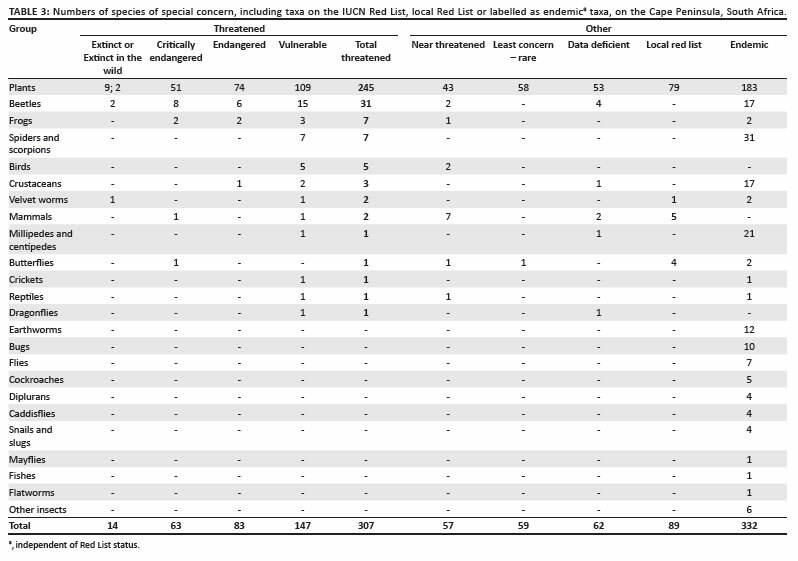 The Cape Floristic Region (CFR) is particularly rich in plant species and also in rare and threatened species (Goldblatt & Manning 2000; Raimondo et al. 2009). As a result there are an inordinately large number of candidate species for monitoring and managing - a significant challenge given data inadequacies and resource shortages. The TMNP was thus chosen as a pilot study for developing a system for selecting species for monitoring, particularly in species-rich situations. The Cape Peninsula is one of the richer centres of endemism in the Fynbos Biome of the CFR (Goldblatt & Manning 2000), with 2500 of the 9000 plant species of the region; more than 194 species are not found elsewhere on Earth. Furthermore, the flora of the CFR is exceptionally threatened: more than half (1736) of all threatened Red List plant species in South Africa occur here (Raimondo et al. 2009). 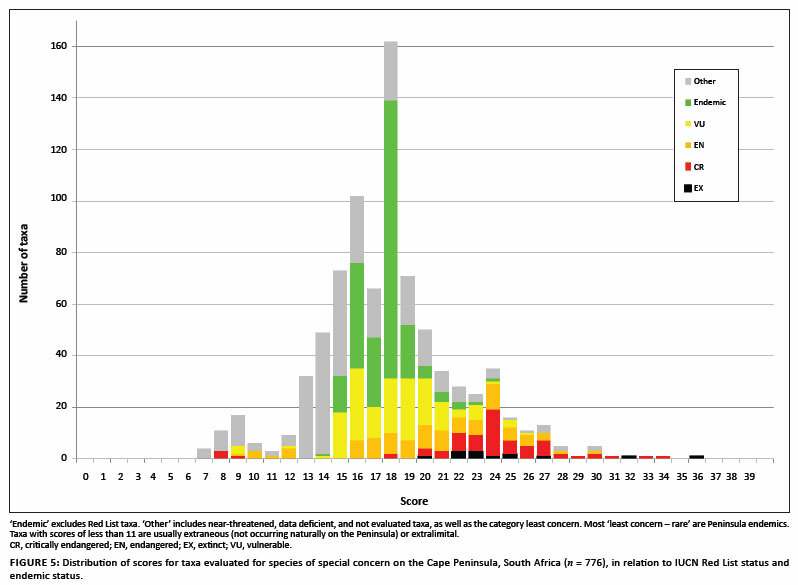 The distribution of these threatened species is also focussed on the Cape Peninsula, with 319 plant species recorded from the City of Cape Town magisterial district and 182 of these historically recorded on the Peninsula (Rebelo et al. 2011). The distribution should be seen in context of the small size of the area, with one threatened plant species for each 3 km2 of the Peninsula. In addition to the high native diversity, some 424 alien plant species are naturalised on the Peninsula (Rebelo, unpublished), thereby constituting 14% of the total flora. Therefore, although the Peninsula is species rich, alien invasive species pose a significant threat to its native flora and fauna (Richardson & Van Wilgen 2004). Although species monitoring remains essential, the presence of 2500 indigenous plant species on the Peninsula requires that the conservation approach focus on ecosystem management, as species-specific interventions will inevitably negatively impact other species. However, species monitoring is also essential for other reasons. Fynbos is noted for its high beta and gamma diversity (Goldblatt & Manning 2000). As a result, monitoring a few 'indicator' variables or species will unlikely reflect population and species-specific changes across the Peninsula. This situation also poses significant challenges to the development of thresholds of potential concern for rare species, described as monitoring endpoints that define the upper and lower levels along a continuum of change, beyond which action is necessary (Biggs & Rogers 2003; Foxcroft 2009). The high spatial and temporal dynamics for Fynbos plant communities (Bond, Maze & Desmet 1995; Privett, Cowling & Taylor 2001; Rebelo et al. in press; Thuiller et al. 2007) is another particular challenge to designing appropriate monitoring systems for relevant species. Where there is conflict between ecosystem and species management, the long-term survival of species in the wild - as well as that of their many associated competitors, symbionts and other species - is possible only within the context of a natural ecosystem. Short-term emergency interventions to save particular species are often best managed ex situ, but long-term conservation must necessarily take place in situ. Ideally all threatened taxa and all locally endemic taxa should be monitored, but even this is clearly a substantial challenge. At the very least all critically endangered taxa - those most threatened with imminent extinction - have to be monitored within the TMNP. However, it is unclear whether this is a realistic goal given available resources. Because no prioritisation exercise has been attempted to date, there is little information available to inform planning for monitoring and subsequent management actions to be triggered by monitoring for species of special concern. The ideal system for prioritising and guiding a monitoring programme is one that considers the actual value of the species with regard to their intrinsic values (e.g. diversity, phylogeny and function) (Bengtsson, Jones & Setala 1997; Turpie 2003), costs of monitoring, managing and saving the species, as well as the costs incurred by delaying an intervention (Joseph, Maloney & Possingham 2009). This would allow a budget of costs to be compiled and different strategies to be evaluated against available funds, or a particular budget to be justified against predetermined goals (Mace, Possingham & Leader-Williams 2006). Unfortunately, such data do not exist for even the most common species, let alone all the species anticipated for a species-rich region such as the Cape Peninsula. Consequently, the consideration of a range of other prioritisation variables is unavoidable. The options for prioritising species for monitoring and management involve either scoring and summing, or categorising criteria and assigning scores, followed by ranking. This process is based on a series of selected variables of conservation priority against which each species is assessed (De Grammont & Cuaron 2006). For example, Regan et al. (2008) used an approach in which species were scored according to known threats, the spatial and temporal extent of threats, and species and population characteristics. Species are subsequently ranked by these variables and for each class (or group) formed, a focal species is selected for monitoring. Alternatively, species may be given values for variables of interest, which are then aggregated (e.g. summed) in some manner to provide a total score for each species. Although both schemes require variables to be selected, and each species subsequently to be scored according to predetermined criteria, in reality, both the assigning of variables and their weighting are influenced by the chosen approach. Therefore it is not straightforward to compare the outcomes of the various approaches. Such approaches are nonetheless simple to implement, provided that comparative data are available across all species.  use responsible and sustainable management interventions under a 'minimum interference' philosophy, which recognises that natural and social systems change over time. The aim of biodiversity management in the TMNP is to maintain the natural patterns and processes of the land and seascapes of the TMNP (SANParks 2008). This includes all representative ecosystems on the Cape Peninsula, which the TMNP represents as the only sizeable conservation area. As part of this goal, understanding and knowledge of species population levels and trends are essential. These data are also required to update the IUCN Red List and national Red Lists, required nationally by the Department of Environmental Affairs. 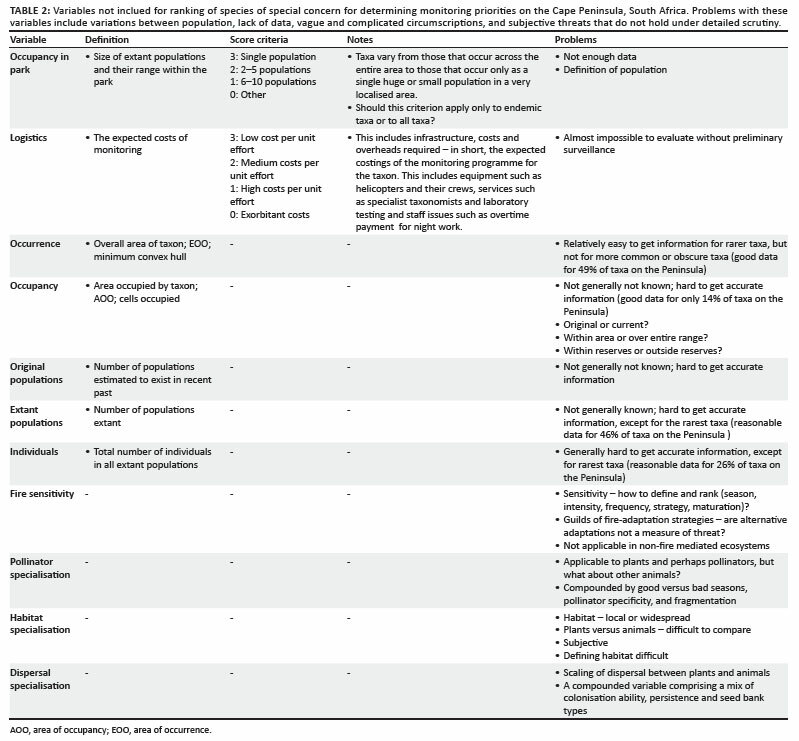 Appropriate monitoring and action thresholds (Martin et al. 2009) for all red-listed species of conservation concern (Raimondo et al. 2009) will be required, without excluding species for which there is insufficient information for formal red-listing. Collaboration with other conservation agencies and initiatives is essential to secure the future of all species over their historical distribution ranges. Part of the mandate is to prevent the extinction of any species within the Cape Peninsula. Management for ecosystem integrity and biodiversity should nevertheless take precedence over single species management, except perhaps in the case of keystone species. A Species of Special Concern Monitoring Programme has been identified as one of 10 monitoring programmes constituting the SANParks Biodiversity Monitoring System (see McGeoch et al. 2011). Monitoring species of special concern, for example by means of the Red List Index (Butchart et al. 2005), is essential to quantify changes in the conservation status of a species and, in cases where extinction risk has increased, to take conservation action. Here the outcome of a pilot study for the TMNP is presented as an approach that may be considered for more widespread adoption within SANParks. 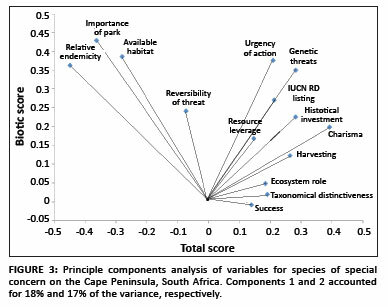 The results for the TMNP are presented with reference to (1) the conservation priority variables selected, (2) a description of the scoring and ranking processes applied to species, and (3) the implications of the outcome for species conservation and monitoring on the Cape Peninsula. A one-day workshop was hosted by the South African National Biodiversity Institute (Kirstenbosch Research Centre) in November 2007 (Younge-Hayes, Rebelo & Cheney 2007). The workshop focussed on selecting the prioritisation variables, developing a procedure for scoring and ranking, and evaluating the output of the system with candidate species. The objective was to reach agreement and obtain ideas for determining which species require monitoring, given available resources and existing threats. A series of questions was posed to guide discussions at the workshop, based on the outcome of species scoring and ranking conducted by A.G. Rebelo (unpublished) prior to the workshop.  Which 'obvious' species are missing for the park? These could not be based on theory or principle; specific species names were required.  Do you agree with the prioritisation variables? Which variables are missing?  Do you agree with the scoring and scoring criteria? Can they be refined?  Does the ranking of the species make sense? If not, what needs to be done? The outcome of the workshop (also presented in Younge-Hayes et al. ) is summarised in Tables 1 and 2 and the discussion section of this paper. Based on the refinement of variables and scoring of species for each of the variables indentified during the workshop, especially those related to monitoring, the database was repopulated. Final values for species and rankings are provided in Supplementary Table 1. Clearly establishing the extent of the area under consideration is essential for evaluating priorities for species conservation and the species scores attributed are necessarily context specific. Traditionally, the Cape Peninsula is the area west of a line from Rietvlei to Sandvlei (470 km2) on the south-western end of Africa (see Figure 1; also Adamson & Salter 1950). The TMNP (250 km2) represents 53% of the area and is the only large reserve on the Cape Peninsula. A buffer zone of 5 km around the borders of the TMNP covers the entire Peninsula as defined above, or up to 18º30' E. The entire TMNP is embedded within the City of Cape Town. This area thus covers the Peninsula Mountain chain as well as lowland areas to the east, traditionally known as the Cape Flats. Although only a small proportion of the Cape Flats occurs in the Cape Peninsula as defined above, several critical conservation areas occur there. (5 ha), Princessvlei (70 ha) and Capricorn Park (5 ha). With the exception of Princessvlei, Sandvlei, Rondevlei and Capricorn Park, which are largely Cape Flats Dune Strandveld, the other Cape Flats reserves are the species-rich Cape Flats Sand Fynbos (Rebelo et al. 2011). The TMNP thus contains most of Cape Flats Sand Fynbos already being conserved(66%) or available for conservation (51%) in the Cape Peninsula and presents, arguably, the only area capable of being managed as a viable natural ecosystem. With the exception of Cape Flats Dune Strandveld, all other vegetation types on the Peninsula are conserved exclusively in the TMNP. Furthermore, four vegetation types, namely Peninsula Granite Fynbos, Peninsula Sandstone Fynbos, Peninsula Shale Fynbos and Peninsula Shale Renosterveld, are endemic to the Peninsula and conserved exclusivelyin the TMNP (Rebelo et al. 2006, 2011). The natural history of the Peninsula is relatively well known. An earlier botanical handbook (now dated) gives distribution data of indigenous and naturalised species (Adamson & Salter 1950). The Guthrie Herbarium, which forms part of the Bolus Herbarium, deals specifically with Peninsula species. Various local field guides also exist (e.g. Trinder-Smith 2006), including some for specific groups such as ferns (Roux 1979), trees (Moll & Scott 1981), Ericaceae (Oliver & Oliver 2000), Restionaceae (Haaksma & Linder 2000), and Proteaceae (Rebelo 2000). In 1996, the Cape Peninsula was the focus of a special issue of the journal Biodiversity and Conservation (vol. 5), where, amongst others, threats and endemics of both animals and plants were reviewed. Conservation issues for the City itself are considered in Rebelo et al. (2011). Local Red Lists have been compiled for almost 25 years (e.g. Hall & Ashton 1983), and the scale of urbanisation in the area has meant that extinctions and near-extinctions on the Peninsula are often explicitly recorded in the national Red List of plants (Raimondo et al. 2009). All scientific names used in this manuscript are supplied in Supplementary Table 1 and botanical nomenclature follows Goldblatt and Manning (2000).  taxa that were previously considered as one of the above or could be confused with one of the above; these were included for cross-referencing, database maintenance and system evaluation. These include taxa that have been split into Peninsula-based and non-Peninsula-based taxa: taxa that were erroneously thought to occur on the Peninsula in the past or that were endemic to the Peninsula, but are now considered part of a more widespread taxon.  species for monitoring fire dynamics (mainly serotinous species, especially Proteaceae), water extraction, climate change and other ecosystem processes. Marine and shoreline taxa were also excluded, although species breeding above the high water mark were included. It is not clear whether having a single listing for terrestrial and marine systems would benefit management and this aspect was not explored further. Another issue is whether only species of special concern should be considered for evaluation to begin with (as described above), or whether all taxa should potentially be considered and those exceeding a specific score should be labeled as species of special concern. In other words, should inclusion be determined a priori based on pre-selected variables, or should initial inclusion be determined by some cut-off value independent of the individual variables themselves, i.e. those species scoring over 30, or the top 100 scoring species? A priori inclusion criteria may even be independent of variables being considered, for example, only non-flying mammals on the Peninsula less than 50 kg in mass. For purposes of monitoring species on the Peninsula, the prioritisation system adopted allows for continuous evaluation of all species (i.e. inclusive), both with regard to continued monitoring of a particular species or determining the next species that requires monitoring, depending on resource availability. Clearly, chosen prioritisation variables should be applicable across all relevant taxa that have available data. Where hard data values are not available, they should be inferred, or alternatively, default values should be meaningful. Where data are consistently lacking, care should be taken that missing data are not scored too low, otherwise these species may never feature in the scheme. This is especially important for invertebrates and other groups that tend not to have as much data as plants and vertebrates. Most importantly, criteria should be explicitly defined to prevent manipulation by increasing the scores of favourite or iconic species. Variable values should be constant for a species and should not vary from one location to another; this can be resolved by selecting a mean or extreme value. Variables should be independent of one another and, even if used as a proxy for some other variable that is less tangible or harder to measure, should not be strongly correlated to other variables used. For example, 'IUCN Red List status', 'rate of population decline' and 'degree of threat' are equivalents and cannot justifiably be considered independent variables in the assessment. It stands to reason that the variables and their scoring should be carefully considered. One of the most important principles is that values should not be double counted. Similarly, if variables are independent and their scores ranked so as to be equivalent, then no weighting or complicated summing procedures should be required. In reality, however, it is almost impossible to obtain variables that are not correlated as there are, invariably, some taxa or attributes that are co-linear. For example, taxa with large individuals tend to be threatened with higher rates of extinction because they take longer to mature, produce less progeny per parent, require larger foraging areas, are less able to hide or escape, are preferentially utilised by humans, etc. Whereas size is an easy metric to recognise in obvious correlations, other less apparent relationships undoubtedly exist. Therefore, although some degree of inclusion of correlated variables may be unavoidable, the inclusion of obvious and strongly correlated ones should be well justified, or the consequence of their joint inclusion at least explored prior to use.  variables that influence management of the taxon and monitoring specifically - the management score. The variables selected for this exercise are not to be confused with variables that may be measured when the selected species are actually monitored on the ground; that is, only a subset of variables are shown in Table 1 and are likely to be measured in the process of monitoring the selected species. The proposed aggregation method was used simply to assign and then add the scores for each species across all the variables. The maximum score would thus be 42 points and the minimum 2 (Table 1). Taxa with the same score are equal in rank and this method thus places each species along a continuum of monitoring priority (for clarity we refer to this summing method as 'method 1'). For comparison, an alternative method based on a categorisation system (see De Grammont & Cuaron 2006) was used, referred to here as 'method 2'. This method ranks species according to four variables, namely (1) Red List status, followed by (2) urgency, and then (3) endemism and (4) importance of park (see Table 1). 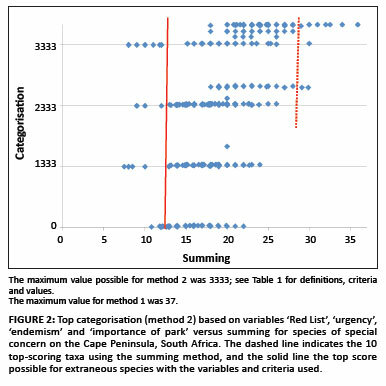 With method 2, the species are scored based on the four mentioned variables, with the highest possible category of species assigned a ranking of 3, 3, 3, 3 (or 3333 for convenience) and the lowest category of species assigned a ranking of 0000 (see Table 1). Some 776 taxa (including plants, mammals, birds, frogs, reptiles, fish and some groups of invertebrates) were included in the list for assessment, with 28 being 'extraneous' (i.e. no longer considered to occur on the Peninsula [Appendix]). The Peninsula has 245 plant and 62 animal taxa listed as threatened on the IUCN Red List, and a further 154 and 24 taxa, respectively, that are of 'conservation concern' (i.e. not 'least concern'), as shown in Table 3. Originally 192 plant taxa were listed as endemic to the Peninsula, but on completion of the Red List these were reduced to 183, with an additional 149 animal taxa considered to be endemic to the Peninsula at present (Tables 3 and 4). Although 89 taxa are on the local Peninsula Red List (Table 4), most of these (80%) also have global Red List status that exceeds 'least concern'. Not all locally extinct animals were included, but most of those with a threatened IUCN Red List status were. Seven animal species currently monitored by the TMNP and associates (African penguin, black oystercatcher, bontebok, Chacma baboon, grey rhebuck, klipspringer and the western leopard toad) were included for evaluation. 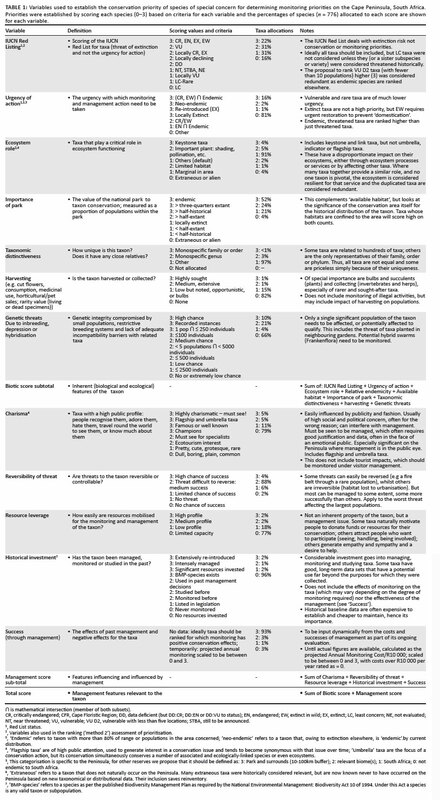 Beetles, frogs, spiders and scorpions are listed as threatened on the final list of species of special concern (Supplementary Table 1), whilst millipedes, centipedes, crustaceans, earthworms and bugs (Insecta, Hemiptera) are listed as endemic (see Table 3). Amongst the plants, nine families each had more than 10 threatened taxa, one had more than 10 locally threatened taxa, and eight families had 10 or more endemic taxa (Table 4). The 10 top-scoring taxa (Table 5) were accepted by participants at the workshop. These include a mix of plants and animals, with a strong emphasis on taxa listed as extinct in the wild or critically endangered. The silvertree, an enigmatic emblem on Table Mountain, features on the list primarily owing to its public profile and past conservation efforts. Two locally extinct antelope that have been re-introduced to the Peninsula and are currently being monitored, also feature. As shown in Table 5, comparison of the top-scoring species according to method 1 (as described in the previous section) versus the outcome of method 2 yielded 59 taxa in the top category (viz. 3333). These featured seven of the top 10 species in Table 5 as well as species scoring as low as 17 (Appendix and Figure 2). On its own, method 2 is inadequate because there are far too many species and its discriminatory power is weak. It is thus not obvious how to rank the top 59 taxa (Appendix), other than by using method 1. The top category taxa include a butterfly, a velvet worm, an amphipod, a frog, 15 beetles and 40 plants (including nine ericas, seven proteas and four sedges). It is also not obvious which further variables should be included next to refine categorisation for determining prioritisation. Further refinement is thus arbitrary. Similarly, it is not clear a priori how to contrive a ranking by weighting criteria in any particular way. More could possibly be achieved with a sophisticated categorisation procedure, but having decided not to construct complicated summing procedures, using a complicated categorisation procedure seemed equally contrived and was not explored further. Despite careful selection of variables, in reality, the variables were found to be strongly, and always positively, correlated. The variables 'importance of park', 'relative endemicity' and 'available habitat' were orthogonal to most other variables, but there was no tight clustering (Figure 3). Management attributes tend to cluster together, but biotic attributes were widely dispersed. Redundancy is suggested only for 'importance of park' and 'available habitat'. Is a biotic score appropriate? Participants at the workshop were worried that the biotic score would be overwhelmed by the management criteria and that taxa important for monitoring would be neglected in favour of taxa that were easier to monitor. However, the 10 top species based on the biotic score are similar to those based on the total score (Figure 4). Six species (plain painted lady, blue-eye uintjie, erica-leaf climbers-friend, Table Mountain copper, Peninsula bonnet and cloud disa) tie for the tenth position with regard to biodiversity ranking, instead of the three lower-ranking species (Table 5). 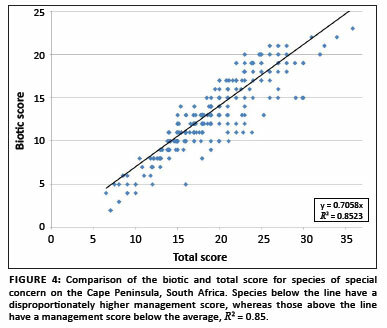 The strong relationship between the biotic and total scores (Figure 4) suggests that the effect of management criteria is not sufficiently large to warrant special attention or any weighting of biodiversity variables. The species elevated into the top 10 over and above their pure biotic score (silvertree, klipspringer and grey rhebuck) are generally agreed to merit special attention. Can priority species of special concern be delimited? Based on the decision to consider any species for evaluation (i.e. rather than using earlier criteria to predetermine species of special concern), determining which species qualify for monitoring based on their scores remains an issue. A fluctuating cut-off score is not acceptable as a target number of species are required to evaluate monitoring progress, available budget and the desired goal. Scores for taxa potentially range between 2 and 42, although the highest recorded was 36 and the lowest 6 (Appendix). The highest score for an 'extralimital' or 'extraneous' species is 16 (at rank 502) for the Outeniqua yellowwood, a highly charismatic species that qualifies as alien to the Peninsula and an ecosystem-transforming invasive species in this context (Richardson et al. 2000). Bats spread it from gardens into indigenous forests. (A possible solution is to allow only male plants to be grown in urban areas within 1 km of the TMNP.) The next highest score was 12 (at rank 725). The lowest score for an extinct taxon was 20 (Peninsula water sedge at rank 173), 18 for a critically endangered taxon (the common button daisy, at rank 286), 15 for an endangered taxon (for four species of beetles, at rank 591), and 13 for a vulnerable taxon (Ochthebius capicola [Coleoptera: Hydraenidae], at rank 704). The lowest score for an endemic taxon, the Cape pepperweed (Brassicaceae), was 14 at rank 653. The highest scoring taxon of least concern is the leopard with 27 points (at rank 13; locally extinct), followed by the river blacktip with 26 points (at rank 28; locally endangered owing to its extreme rarity). As for other extinct charismatic taxa, the leopard will not require monitoring unless it is re-introduced onto the Peninsula. 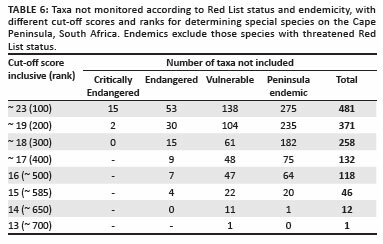 If an alternative cut-off score is considered for monitoring, 118 Red List and endemic taxa would be excluded at a score of 16; 46, 12 and 1 taxa would be exluded at scores 15, 14 and 13, respectively (Table 6). We therefore propose that a score of 15 be used as the cut-off for a species of special concern, resulting in 653 taxa that require monitoring under ideal circumstances. By comparison, monitoring only the top 100 taxa would result in 481 Red List and endemic taxa not being monitored (Table 6), whilst monitoring the top 200 would omit 371 taxa. If the top 300 and top 400 were monitored, 258 and 132 taxa would be omitted, respectively. 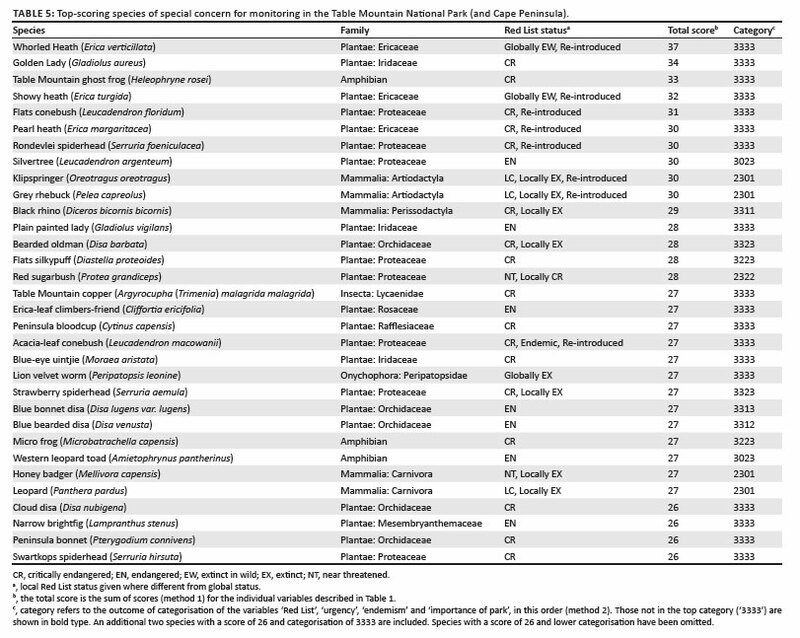 All these levels would result in a large proportion of Red List and endemic species not being monitored and every attempt should be made to obtain funding to monitor the top 650 taxa as a minimum goal. It is not possible to ascertain how many species could feasibly be monitored, as it will depend on both the logistics involved and the intensity of monitoring required. This will be explored in a subsequent paper. However, it should be noted that only 543 of 2500 plant taxa on the Peninsula (approximately 22%) were scored, and only 171 taxa out of thousands of arthropods (Pryke & Samways 2008). The frequency distribution of taxa by score suggests that incorporating a score below 18 would result in many additional taxa being included as species of special concern (Figure 5). The status of many of these species is 'near threatened', 'data deficient', or 'least concern: rare'. It could be argued that these should also be monitored, but adequate resources do not exist. It is essential to progress from a prioritisation system that targets specific taxonomic groups to, as we did here, one that considers all taxa in one system. In the past emphasis on, for example, large mammals and birds led to unjustified competition for resources and funds (Mace et al. 2008; Sitas, Baillie & Isaac 2009). All taxa, from various ecosystems, need to be evaluated in a comparative system, using a common currency across all groups. This has been achieved by the IUCN Red Listing process., which assesses extinction risk (IUCN 2006). A similar goal is strived for here, although the criteria for inclusion and priority are more varied. Providing managers with a single list of species for prioritisation and monitoring is likely to be more effective. Although the rankings are park-specific, the framework can be used to compare parks and problems between parks. Compiling a single, agglomerative listing across different management units (nature reserves or national parks) currently serves little purpose, as budgets are usually park specific. However, such a list could be used for justifying funding allocations for monitoring across park clusters. We do not suggest that all criteria used here should be used across parks, but rather that the approach outlined in this paper should be tested on different parks prior to any widespread adoption. Furthermore, the values assigned to species for the variables in Tables 1 are dynamic and should regularly be assessed against available information for each species, preferably in an open forum every 5 years. It is also important to keep in mind that the approach outlined here is for the purpose of identifying and prioritising species for monitoring and conservation action and not for assessing their conservation status per se (the latter being achieved using the IUCN Red Listing process). Taxa that are extinct in the wild or locally extinct should, wherever feasible, be re-introduced and subsequently become a particular monitoring concern. However, historical sites for extinct species that have not been totally destroyed should be monitored occasionally to ensure that the species has not re-emerged. For example, although Mimetes stokoei in the Kogelberg did not emerge for three fire cycles (45 years), presumably because the block burning system resulted in low intensity fires, seeds germinated from the seed bank after a high-intensity summer fire in 1999 (Rebelo et al., in press). However, the resources allocated to their monitoring will be minimal, although it may vary with potentially greater investment for species with underground seed banks (e.g. erica versus protea), for smaller rather than bigger organisms (e.g. earthworm versus rhino), and for species more recently extinct (e.g. Leucadendron grandiflorum (1805) versus Isolepis bulbifera ). Therefore, extinct and locally extinct taxa should be maintained on the list as a high priority. This all-inclusive approach is slightly different from the approach developed in the savanna of the Kruger National Park where all Red List animals were considered for monitoring (Freitag-Ronaldson 2006), whilst other species were prioritised for monitoring. However, on the Cape Peninsula, with over 600 threatened Red List and endemic species, it is not feasible to monitor species of special concern using such an approach. Many of the Red List taxa on the Peninsula are Cape Flats species that have been heavily impacted by urbanisation. However, only the Tokai section of the TMNP occurs on the Cape Flats, the remainder of the National Park being largely mountain habitat. Nevertheless, the Tokai area of the Park is the largest area of this veld type currently conserved and represents the most important conservation contribution to the veld type in the southern half of Cape Town (Rebelo et al. 2011). Furthermore, although the Tokai section is representative of this veld type, little more remains; that which does remain is in City of Cape Town nature reserves. This is further complicated by large areas of the Tokai area of the Park still being under pines. This area thus requires restoration, which depends on fire for the regeneration of fynbos from the seed banks. As the last area is currently scheduled for restoration in 2024, it will not be possible to determine the population sizes and species complement of the Tokai section of the park, compared to the original Sand Fynbos species pool, for many years. How much effort should the TMNP spend in monitoring Cape Flats species, given the small area of Lowland Fynbos in the TMNP? Obviously, close cooperation with the City of Cape Town and amateur botanists will be required. Ecosystem management in the area should be considered within the context of its unique situation as the final outpost of the Cape Flats ecosystem, and species should be managed accordingly with due care to population sizes, genetic integrity and symbiont needs. A high-priority, threatened ecosystem approach to its conservation is thus critical until (and indeed after) further species-level information becomes available. A Species of Special Concern Monitoring Programme has been identified as one of 10 monitoring programmes constituting the SANParks Biodiversity Monitoring System (see McGeoch et al. 2011). The challenge for protected areas generally, and in this instance specifically for the TMNP, is to establish a realistic monitoring programme for species of special concern based on an agreed set of variables for establishing conservation and monitoring priority. This is necessary given limited resources, accelerating pressure on species and the enormity of the task at hand, particularly in species-rich regions such as the Cape Flora (and most specifically the Table Mountain and Agulhas National Parks). Specific monitoring programmes for such species also need to be robust and enable separation of natural population fluctuations from anthropogenically induced declines (Spellerberg 2005). This, along with an assessment of the associated monitoring costs and implications, as well as an outline of theoretical thresholds of potential concern for such species, will be described in a subsequent publication. We have shown that a prioritised species list for monitoring species of special concern can be compiled across diverse taxa, within diverse ecosystems, and that experts can both contribute and agree to the ranking so obtained. Although the priority species for monitoring have been identified, this will need to be tempered with the monitoring costs and logistics of implementing such a programme. We thank Jonathan Ball for information on butterflies and chafers, Paul Brock for stick insects, James Pryke for dragonflies and leaf hoppers, and Clive Turner for water beetles from diverse Coleopteran families. We thank participants to the one-day workshop that was held at the Kirstenbosch Research Centre on 15 November 2007. We thank SANBI, especially Tilla Raimondo and Lize von Staden for access to detailed information on the Red List taxa. We thank Pat Holmes for useful discussion on topics.